If someone told me that I could only cook from one cookbook for the rest of my life, I’d choose Karri Ann Allrich’s “Cooking by Moonlight, a Witch’s Guide to Culinary Magic.” Perfect for seasonal cooks, this book contains full menus with recipes for every moon (month) of the year, including a special section for blue moons. Chapters on developing seasonal intuition, stocking a moonlit kitchen, using herbs and spices magically, and even love foods lead the mind to endless possibilities. Also, every single one of the recipes is absolutely fabulous. I would love to meet this woman! 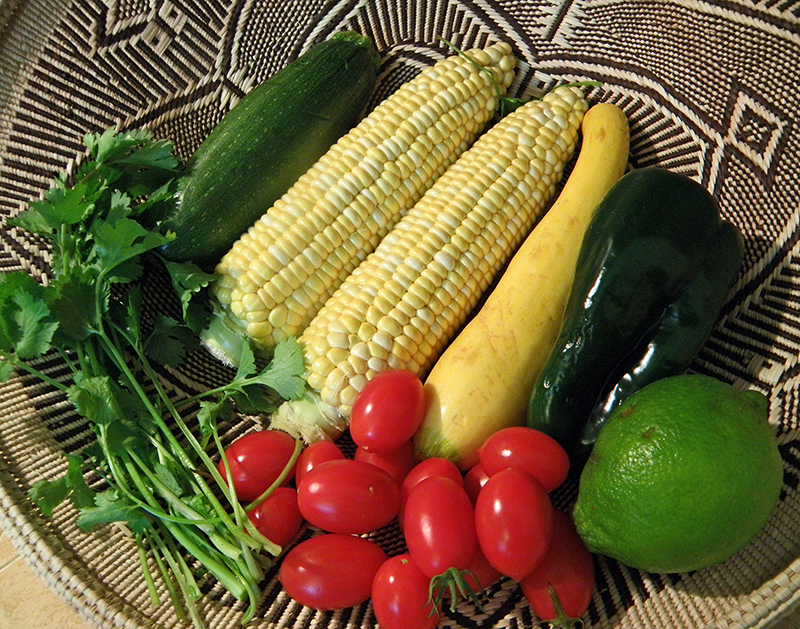 “Three Sisters” refers to the sister crops corn, beans, and squash, which Native Americans planted together. 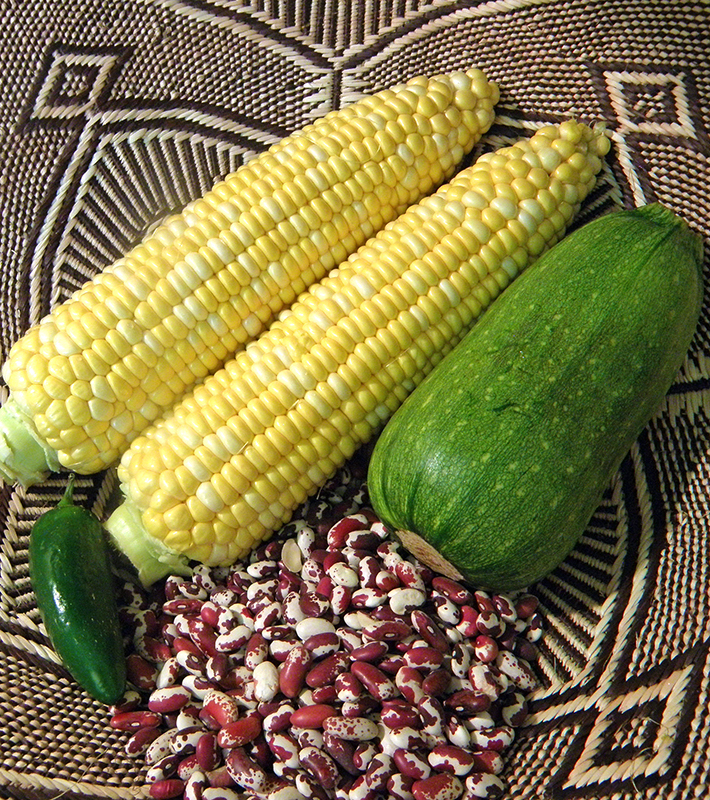 The ancient wisdom of eating these together has been quantified by food chemists who tell us that beans and corn make a complete protein. Corn, beans, and squash are high in fiber, and squash contains large amounts of vitamin A.
I’ve added fresh seasonal sweet and spicy peppers to the mix, boosting color, flavor, and vitamin C content…and mostly because I had them on hand. The semi-spicy/spicy peppers I used were (1) jalapeno and (1) poblano. Hungarian wax peppers or large padrons, or any chilies you like can be substituted. The original recipe calls for canned green chilies or jalapenos, and these can be used in a pinch. I made a huge quantity to share with friends (and because I got a super deal on local organic no-GMO corn,) and this recipe can be cut in half. 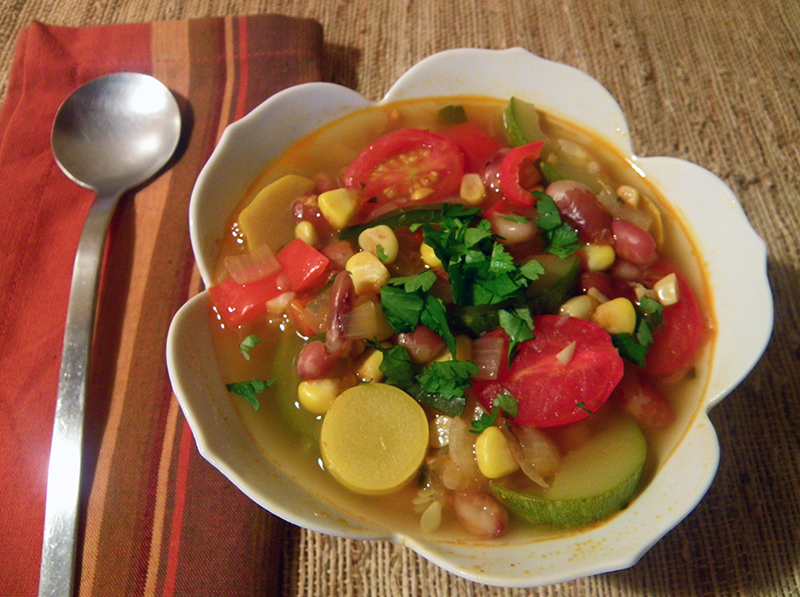 I used fresh Anasazi (variety of pinto) beans, but you could substitute 2 (16 oz.) cans of kidney beans. The original recipe notes that you can choose to substitute winter squash for the yellow and green summer squashes. Cooking By Moonlight is out of print, but used copies are still available. If you like this seasonal stew you might want to pick up a copy. The author states that this recipe celebrates the wisdom of interdependence. Let us contemplate this as we move closer to the darker time of the year. Prepare the Anasazi or pinto beans in advance. Soak overnight, or “speed soak” by bringing to a boil for 5 minutes, letting them sit one hour, then draining. Add water to cover beans by 2 inches, bring to boil, and simmer till done. Check every half hour or so. The Anasazis need cook only about 45 minutes. Drain. Meanwhile, prepare all the vegetables. Chop onions and mince garlic. 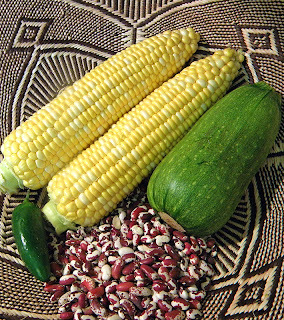 Remove corn from ears. Cut squashes in half lengthwise and slice into half moon shapes. If squash is large, cut half moons in half again. Finely chop the hot chilies and slice or dice the sweet peppers. Cut cherry or grape tomatoes in half. Wash cilantro, remove leaves and chop them. In a heavy bottom soup pan, heat the olive oil over medium-high heat and sauté onion until it softens, about 5 minutes. Add the garlic, cumin, and chili powder, lower heat to medium, and cook briefly, about 1 minute, stirring to distribute spices. Add squash and corn. Cook for 5 minutes, stirring to coat squash and corn with spices. Add broth, and green and red chili peppers, and stir well. Cover and bring to boil, then lower heat and simmer gently till squash and peppers are done, about 10 minutes. Turn off heat. 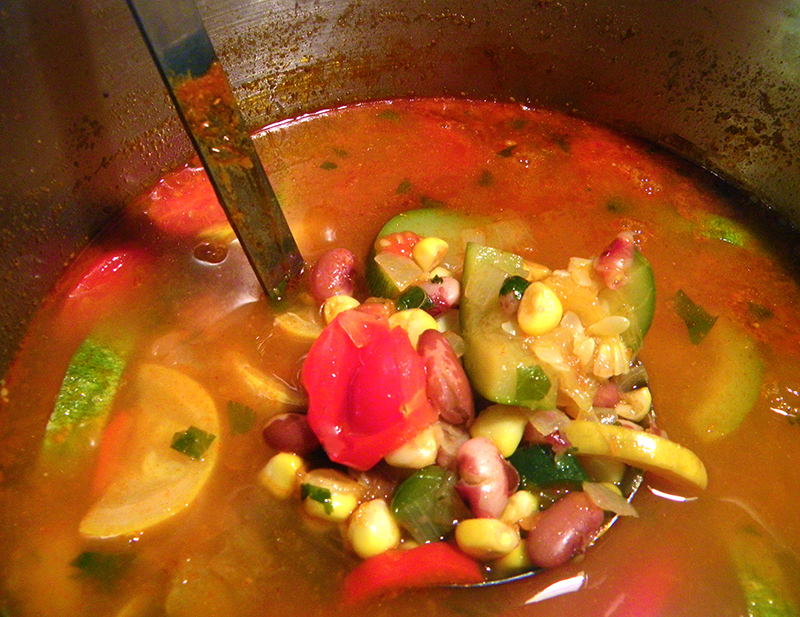 Stir in tomatoes, lime, and half of the chopped cilantro (¼ cup). Season with sea salt and pepper. Let sit for 5 minutes until tomatoes and beans are heated through. 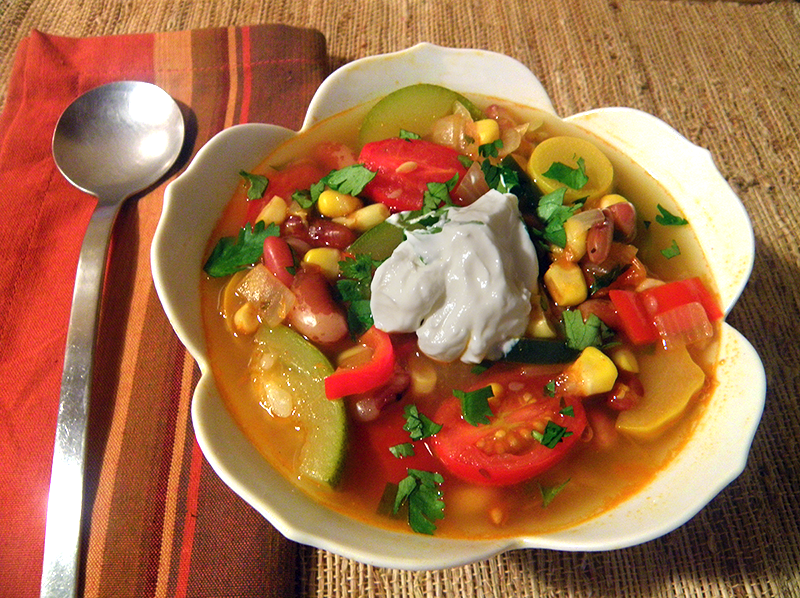 Serve garnished with additional cilantro and low fat sour cream. I really liked this recipe. There are not many soups or stews that I can enjoying day after day for a week but this one I definitely did. The really excellent corn that was used in it was part of that though. This dish really lets the original nature of its ingredients sing out where they get sort of hidden in other recipes. I am really enjoying your writing style here too. Makes reading about these things very enjoyable. Your personality really shines through.